Midwest Academy is located in Naperville, Illinois, and is proud to attract the very best students and teachers in Chicago and the western suburbs. David B. Hakim, Academy Director, started training in the 1980's. In 1986 he began training in the system that would ultimately become the core of the Midwest Academy. His original school — Midwest Academy's predecessor — was founded in 1968, and Midwest Academy started in 2005. The school was founded on multiple martial arts disciplines and real-world military and law enforcement special operations experience. These twin pillars are at the core of our focus on both technical and personal leadership skills. The training provided at the Academy provides functional fighting skills as well as the process for unification of thought and action. With this training, our students can move their lives in whatever direction they want. 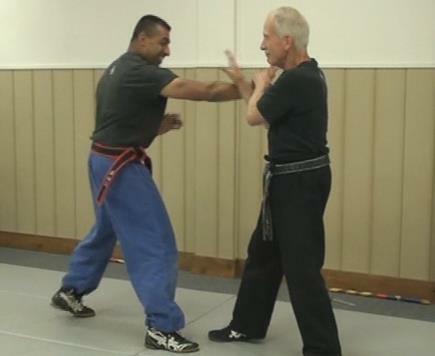 As a multidisciplinary school, we teach several martial arts together and provide training in the use of weapons, such as sticks, blades, and firearms. Each area of training relates to all the others, and together they form a comprehensive whole. Midwest Academy is different from any other martial arts school out there. Five things distinguish us from our competitors: what we teach, why we teach it, how we teach it, whom we teach it to, and who teaches it. We are specialists in facilitating personal growth and leadership development. We do this through our practical, experience-based unarmed and armed martial arts and unique firearms-combatives curriculums. In addition to the practical reasons to study martial arts (increasing personal protections skills, optimizing health, and enhancing situational awareness), our training develops mental toughness and emotional resilience — personal traits that influence success in all areas of life. We don't just teach you how to identify, avoid, or mitigate dangerous situations (you learn that too! ); we help you become the best version of yourself. We could tell you about how we break down complex skills into smaller components, perform the appropriate amount of deep practice, and lead meaningful repetitions to myelinate the neural pathways so that the skills can be performed automatically. But you will get enough exposure to learning theory and performance-based training theory once you are training with us. Have you ever been in a class — maybe an academic or professional one — where you began to wonder if the teacher even knew you were there? Like you, we have also been in those "lost-in-the-crowd" type classes; that's why it's our priority to personalize classes by individually tailoring lesson plans to the specific needs of each student. Our students never worry about getting the attention they need to excel. Our teachers understand that class time is your time. Although we use a traditional dojo ("martial arts school") structure, our atmosphere is relaxed rather than rigid. Most students find that it's not only acceptable, but unavoidable, to have a great time training. Since our classes are planned and structured, the training experience is conducive to learning, developing, and mastering new skills. Invest some time training with us, and you will become good; make it a regular discipline and put in a little extra effort, and you will become great — not a bad perk! The best way to understand how we teach is to experience it. We invite you to do just that as our guest! The Midwest Academy looks for nearly the same qualities in a new student that new students look for in a martial arts school. You might say that we are as selective in choosing you as you are in choosing us. The Academy exists for the success of our students. We have been teaching since 1968, and to keep our success rate as high as it is we only accept students who bring a positive attitude with them. The quality of a class depends on the quality of the students and teachers, so we require our teachers to bring a positive attitude as well! This single requirement allows us to provide a safe, exciting, and rewarding training experience. The approach is both traditional and progressive; the Academy roster is devoid of "compete-to-kill" mindsets, "cultish" peers, and other negative elements. Due to the practical content of our system, we prefer that students in our adult classes generally be at least 17 years old. Youth students may be accepted as young as 13 years old, based the approval of the director after an interview with both the potential student and parents/guardian. Youth students in their teens receive training in the adult program on an individual basis as dictated by their physical, mental, and emotional maturity. A youth student's curriculum will be individualized to that particular student's needs. We look for the same things in students that they look for in a school: a commitment to excellence! We have a very deep bench of experienced teachers with both formal training and real-world experience. All of our teachers have a decade or more in experience and not just teaching this. Read our staff bios or contact us to learn more about Midwest Academy.